[05-oct-2017] I have updated the topic with new information, Please read the full topic from the beginning. An objective must have one or more tasks. Not all tasks needs to be mandatory, but if you won’t flag at least one task as mandatory then objective will be ignored during “goal” evaluation (this is not bad by itself, just be aware of that). We define the tasks inside the Objective element. Be flagged as "mandatory", which means, it is part of Objective success evaluation. A dependent task, creates order between tasks. This means that “dependent” tasks won’t be evaluated until at least the “parent” task will be flagged as “complete” at least once (complete = success). When we have a mandatory task, one or more, the objective tests if ALL mandatory tasks are flagged as complete (success). This means that you must be careful when you set a task as “mandatory”, since the plugin will expect ALL of them to be “complete” when it evaluate them. An objective won’t be set as “complete” (success) as long as one of its “mandatory” tasks is not “complete”. Non mandatory task is ignored during evaluation of objective. A “Task” is a new concept in Mission-X v3, the idea is to define a "to do" action that combined with other tasks will create an objective and goals. A task highlights “what needs to be done”. It has certain configurations that take shape during Objective iteration. A task must be linked to a trigger or a script. The bulk of logic resides in them. Here is an updated snippet of a mission file I'm working to test the new code. You can see that the definition of a mission is much shorter than in Mission-X v2, but it also not hierarchy organized, so you need to keep track of what you are doing. [09-oct-2017] uploaded better image. Click on image for larger view. The mission file I pasted here, is divided into categories for easier reading. A task is merely a template that define an action a simmer need to fulfill. A task needs to have a unique name and can have title to display to the simmer. It must be based on a trigger or a script. When you base a task on trigger, you probably want it to be based on a physical location, like when a plane touchdown a runway, for example. The last attribute I want to comment on, is the "always_evaluate". This means that even if a "task" has been completed (meaning success), the plugin will continue to evaluate it and modify its state. A set of tasks (1 is also fine), represent an Objective. An objective have 1 or more tasks in it. One task should be a mandatory ( I'll speak on that topic later). "name" of the task - must be unique in Objective. "depends_on_task": A task can be dependent on other task, which help optimize performance. "mandatory": If a task is mandatory. "always_evaluate": This is an important attribute, it basically tells the plugin that even if the task "is complete" the plugin will continue to evaluate it, and modify its state. This is crucial for a success design of multiple mandatory tasks in same Objective. Task 1: you need to enter park area. Task 2: you need to pull park-brake, in the park area. Both of the tasks are mandatory. Which means that plane must be in the parking area during "Task 2". If you won't define the attribute: "always_evaluate" for both tasks, it might not behave as you expect, and Objective can be flagged success even when plane has exit the park area. The "depends_on_task" attribute, allow us to define order of evaluation against other tasks only in same objective. For example, lets assume we want the simmer to land in KOAJ airfield, and then park in GA parking area. For that we prepare two tasks: "ReachParkArea" and "ParkInKOAJ". You can check the mission image above. Please pay attention that the "ParkInKOAJ" task is dependent on "ReachParkArea", which means that the plugin will first evaluate any not dependent tasks and then will evaluate all their dependent tasks recursively. Plugin does not need to evaluate dependent tasks if their "parent" task is not complete. A designer can direct the simmer which steps to do to achieve an Objective. Example: We can create a set of tasks that define a run-up test of a Cessna 172c. In this case we should only flag the last task as mandatory, and thus we will have a complete objective. Please be advice that this is a snippet of a test mission, so there isn't much detail in it, and design might change, although the concept should be the same. This was one of the things "xplaneuser" sent me when he shared with me his work on Papua, I strongly suggest you try this scenery. The trouble is that I do not have much time coding, and sometime coding is like a fever, you just want to reach another milestone and quit, but then you think about another milestone and.. well it is a vicious circle. In any case, I would like to share few things and thoughts about the next iteration of Mission-X. First, work is progressing quite well, better than I expected. I covered most of the core features, and I'm nearing working on the main "flight loop back", which is the main plugin loop. Why is it important you ask ? Well, this flow bind the features together and execute them like round robin. There is still a long way to go, but I'm hopeful to have first Alpha by the end of September or October. My goal is to bring your plane to the exact location and state you were flying, but the amount of Datarefs that can be store is huge, while I think there is no need to store them all, some filtering work should be done. This effort will take some time and I'll need many tests before I will fill comfortable. Basically we will save the whole mission but in a simpler format, so it will be just like a savepoint rather then just a checkpoint. You won't need to load the mission to load a checkpoint. You will just have to load a "savepoint" (mental note: change the checkpoint name). Support for array datarefs. Although the plugin do read/write array datarefs, I'm not sure I'll expose it. UI: user interface is an important part, but until we will get our hands on the new SDK extensions, I won't be able to test and examine their capabilities. Unfortunately I'm not that talented in UI designing, but I hope I'll be able to create a functional interface. Please do remember that the main thing is flying, and not looking at the MissionX screens. If by any chance you are reading this and want to get involve in the UI programming, ping me. Vulkan support: Well, that is a topic by itself. What I understand from Ben Supnik is that there will be a Vulkan binary for x-plane or opengl binary. You can't mix them both. Just like the 64bit and 32bit x-plane binaries. What is worse, is that all opengl code will break in the new Vulkan binary, so we will need to rewrite the whole code to support Vulkan API. Since I have no knowledge in Vulkan, this will be a longer term effort. In any case, 99% of the plugin code does not need special rendering API, and I think that I'll stick with only one technology in order not to spread thin my time. I think it will Vulkan, so it will be future proof. Compatibility: Mission-X v3 will only work with XP11 v11.10 and up. I want to use the latest SDK, and the latest graphical interfaces. I do not want to work on compatibility implementation, again, due to the limited time I have. Overall, the past month was a real challenge in the programming department, well for me, and the progress seem promising. i will keep you updated and hopefully I'll start publishing some scripting examples. Plugin fetch the script code and inject “seeded parameters”, some of them will be empty, depends on the stage when it was called, example: “mxGoalName" will have "goal1" as value while "mxCurrentTrigger" will be empty since there is no trigger evaluated right now. These parameters indicate from where the script was originated.But there is an easier way, as I stated in my previous message, It is always best to name a script with the desired function name in mind(*), example format: “script1.func1”. The plugin will call the script “script1” and will send the parameter “mxFuncCall” with the value “func1”. (*) Exception when you call scriplet code. 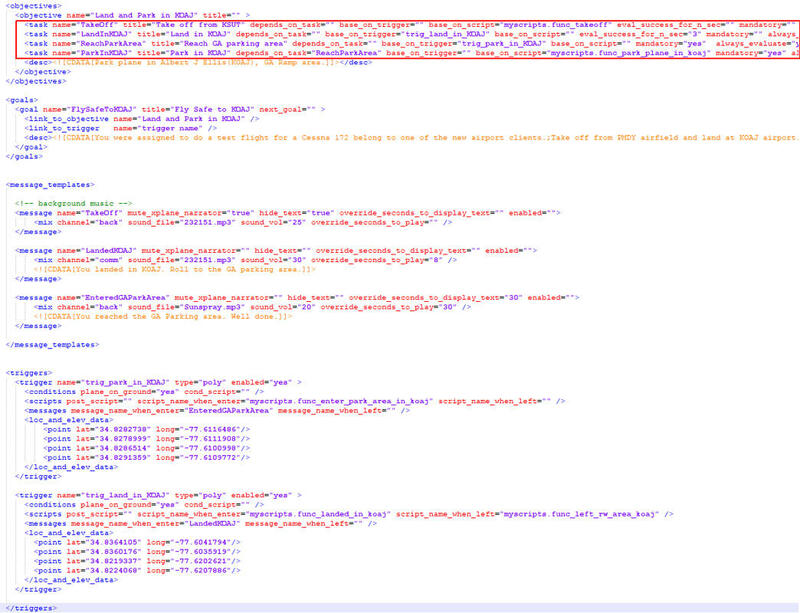 These are very short (probably one liner) of code embedded inside the XML mission file. Once parameters were seeded, the plugin execute the “embedded script”. The script can also call specialized functions from the plugin and set variables for later use, but only in the plugin side, parameters on the script side will lose scope (erased) after script finish execution. What we should write in the script files ? The script is first and foremost to allow the designer write simple logic on DATAREF information, and make decisions based on their values. Send communication like message/s to simmer. Send 3D messages (text messages on the top right hand of the screen). Simulate simple scenarios on plane systems. Currently not all of these actions are supported, but I believe they will be in the near future. Please remember - code must be short and to the point. Bad code can stop X-Plane or hurt performance.